A few weeks ago, I introduced two concepts: stock and flow. I’ll develop that a bit to help the reader analyze their portfolio with a bit more clarity. To avoid confusion between stocks, as a type of investment, and the concept of a stock as in a reservoir or pool of something, I’ll refer to the concept as a pool and stocks as a type of investment. Each month we might check our investment and bank statements to find that the value has gone up or down. In any one day only a tiny portion of stocks and bonds trade, yet these transactions determine the value of all the unsold assets, including the ones on our statement. As I mentioned a few weeks ago, the flow from a reservoir of water determines the value of all the water in the reservoir. It is like the butterfly effect, the idea that the fluttering of a butterfly’s wings in Mexico can cause a typhoon in southeast Asia. In financial terms, when a small event has a large influence it is called leverage. A flow, a transaction, is the catalyst for a transfer of value from one asset to another. Let’s look at an example. We buy a 1000 shares of the XYZ biotech firm for $10 a share, for a total investment of $10,000. The next day the FDA announces that, contrary to expectations, they will allow a drug trial to proceed to Phase 3. XYZ’s stock price rises 10% in response to the news. The market price of our investment is now worth $11,000. Where did the other $1000 come from? An asset value rose, so the value of another asset pool fell as the value is transferred from one asset to pool to another. Yesterday $10,000 of cash was worth 1000 shares of XYZ. Today, that $10,000 of cash is worth only 909 shares of XYZ. This is a different way of looking at cash – not as a liquid medium with a stable value – but as an asset with an erratic value. What is cash? It is an investment of faith in the United States. We might give it a stock symbol like CASH and I’ll use that stock symbol to distinguish cash when it acts as an asset. Stockcharts.com allows users to track the relationship between two stocks, or to price one stock in terms of another. We do by typing in the a stock symbol ‘A’ followed by a colon and a second stock symbol ‘B’. Stockcharts will then show us the value of A priced in B units. Below is the chart of Google (GOOG) priced in Apple (AAPL) units, or GOOG:AAPL. On the left side of the chart in early 2014, Google’s stock was worth about 6.25 “Apples.” By mid-2015, Google’s stock had fallen to 4.25 Apples. Did Google’s value fall or Apple’s value rise? Let’s imagine that we live in a world without money, as though we had taken the red pill as in the movie “The Matrix.” Without a fairly constant measure like cash, we simply don’t know the answer to that question. Imagine that each investor gets to choose which asset they want their monthly statement priced in and that our choice is Apple. Over a year and a half, we see that we have lost about a third of the value of our portfolio of Google (6.25 / 4.25 = about 2/3). We can’t stand the continuing losses anymore and sell our Google stock and get 4.25 units of Apple. It is now September 2016 and we still have 4.25 units of Apple because Apple is our measure of value. 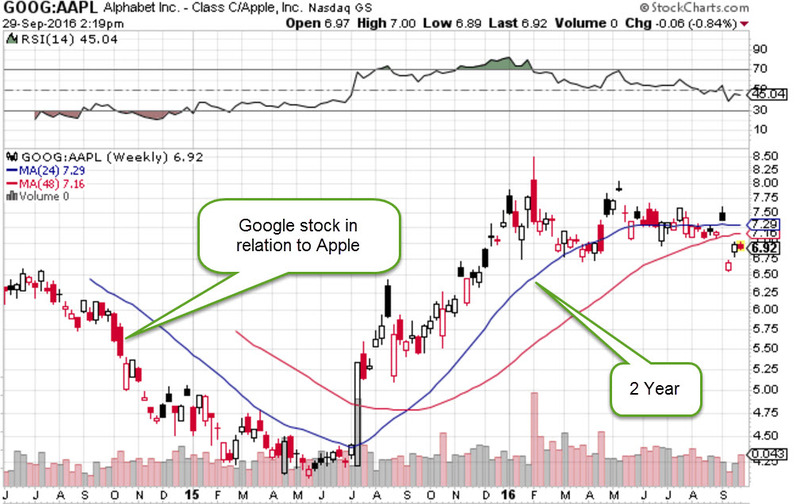 Had we continued to hold the Google stock, we would have 7.29 Apple units. Now let’s turn to a slightly different example. We are going to price CASH in Apple units, the inverse or reciprocal of how we normally do things. When we say that Apple’s stock is $100, for example, we are pricing Apple stock in CASH units, or AAPL:CASH. Instead we are going to look at the inverse of that relationship: pricing CASH in Apple units. Remember, we are no longer in the matrix. We begin with the same portfolio, 6.25 Apple units in early 2014. We think that this CASH asset is going to do better than Apple, so we sell our Apple units for CASH and get 68 cash units for each Apple unit, a total of 425 cash units. In mid-2015, we find that our CASH units are now worth only 3.5 Apple units. We have lost about 45% in a year and a half! We sell our CASH units and get 3.5 Apple units which is what we still have in this latest statement 15 months later. Our losses are even worse than that. Each year, Apple gives the owners of its shares another 2/100ths of a share as a dividend. The owners of CASH get only 1/100th of a cash share each year. Apple pays those dividends from its profits. For owners of CASH, a financial institution pays the dividends from its profits. While the Federal Reserve, a creation of the Federal Government, doesn’t directly “set” interest rates it effectively does so through the purchase of bank securities. Each dollar bill is equivalent to a share in an entity called the United States and it is ultimately the U.S. government that largely determines the dividend rate that is paid on safe investments like savings accounts. To remain competitive with safe investments, Apple only has to pay a little more than the very low dividend rate that savings accounts are currently paying. If interest rates were 5% instead of the current 1%, Apple would have to devote more of its profits to dividends to appeal to income oriented investors. By keeping interest rates low, the Federal government effectively allows Apple to retain more of its profits. Where does Apple keep that extra money? Overseas and out of the reach of the IRS. That’s only part of the irony. If Apple had to pay more of its dividends to the share owners, the share owners would pay taxes on the income. So the U.S. government loses twice by keeping rates low (See footnote at end of blog). So CASH is effectively owning the stock of an entity called the United States, which doesn’t make a profit. In the long run, owning the stocks of companies that do make a profit generates much more return to the owner. Let’s look again at the leverage aspect of stocks and cash. Earlier I noted the huge leverage involved in stock and other non-CASH asset transactions. A tiny number of transactions affects the value of a large pool of assets. On the other hand, millions of CASH transactions take place each day and have little effect on the nominal value of CASH. So we price highly leveraged assets – stocks, bonds, etc. – in terms of an unleveraged asset – cash. Cash plays several roles. First, as a medium of exchange, it acts as a measuring stick of economic flow in a society. This first role has a symbol – $. Secondly, as an asset pool, CASH acts as a holding pond, a reserve in the waiting, the first in the asset reservoir to be tapped. Lastly, it acts as an insurance on the principal of other assets, like stocks and bonds. Let’s call that INS. As an insurance, let’s consider a portfolio of $900 in stocks, $100 INS. A 10% fall in stocks is reduced to a 9% fall because of the INS position. Let’s consider the exact same portfolio, except that the investor’s intention is that the $100 is a CASH investment, a reservoir of asset buying power. The same 10% fall in stocks is now a trigger for additional purchases. In the first case the $100 is an anxiety reduction fee; in the second, a prediction of a market correction. An investor might blur the distinction between the functions. Retired people who want to preserve the nominal value of their savings may tend to keep the majority of their nest egg in cash without distinguishing the different functions. Cash = safety and liquidity. Because cash is used as a yardstick, its nominal value is kept constant. But what that cash can buy, its purchasing power, changes. When they need some of that CASH ten years from now, the purchasing power of that asset may have fallen by 30% but the nominal value is the same as it was ten years earlier. As noted before, companies must make a profit or go out of business. Not so the U.S. government. Over time, the rate of a company’s profit growth must exceed the inflation rate, so that stocks give the best investment return in the long run. Investors would benefit by separating their cash position into its functions, $ and CASH and INS, to understand more clearly what their intentions and needs are for the coming year. This can be as simple as a piece of paper that we review each year. 1) income for the next year including emergency fund – $50K – $ function. 2) stock market seems awfully high and it has been a while since there has been a 10% correction – $100K CASH function. 3) $30K INS function to help me sleep at night in case there is more than a 10% correction. Why write it down? Believe it or not, we forget things. Offsetting the tax losses to the government is the fact that some of Apple’s cash consists of cash-like equivalents like Treasury bonds which pay a very low dividend. Apple loses income because of the low dividend and the U.S. government gains by being able to borrow money from Apple at low rates.